I’m not really one for the world of fashion. Hell, most straight men aren’t. I usually don’t bother with much other than a t-shirt and jeans, but there is one type of accessory that I simply adore. Hats. Yes, hats. I’ve always been quite fond of wearing hats of all shapes and sizes. Sadly, my head is gigantic, so most of the time I look silly with a hat on. So I took that to my advantage, and now I’ve become quite an avid collector of silly hats. Well, maybe not so much a collector, but I do have a penchant for acquiring unusual headwear. You know who else wears a wide variety of hats? Kirby. And there are even more similarities than that between me and the little pink marshmallow. See, when Kirby puts on a new hat, it bestows him a power that is somehow represented by that hat. My hats have similar qualities, only slightly less fantastic. My hats don’t make me a master swordsman or allow me to breathe fire. No, those abilities are constant. That’s far more than enough of a preface, don’t you think? Yes, I’ve rambled a bit too much, so let’s get on to the hats already! The first hat is the cowboy hat. 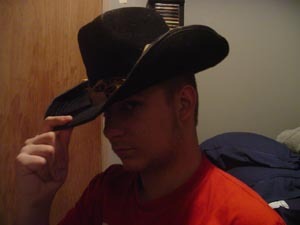 This cowboy hat actually used to belong to my dad, but it was handed down to me a couple years ago after I expressed how much I enjoyed wearing it. Sadly, it spends the bulk of its time as a decoration rather than as a hat. The cowboy hat not only gives me the skill to wrangle various types of cattle and ride bulls with the best of them, but it also does an excellent job of bringing out my inner shirtless hunky cowboy. This trait is key in scoring with hot models and your mom. I’ve always wanted a top hat. I’ve made it clear to everyone I’ve come in contact with in my whole life ever at least once. While I’ve yet to get my hands on a real top hat, a couple years ago my mom decided that it would be funny to get me a plastic top hat for New Year’s. The thought was appreciated, but the plastic top hat was thrown to the wayside soon after the event. Now it is used mainly as a bucket that holds my bank statements and crayons. The plastic top hat is a favourite of Party Ryan, though it is still only used on very drunk occasions. 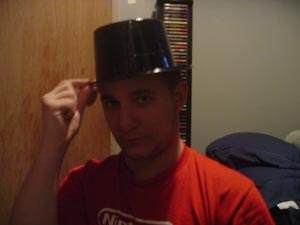 It provides me with the power to be funny and to ring in the new year with a plastic hat. Then again, the funny might just be a side effect of the booze. 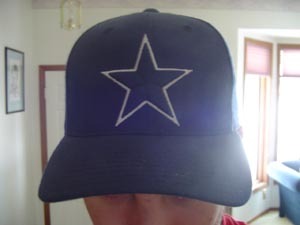 This hat is probably the least original of the bunch, being a dime a dozen. Or… 24 dollars a dozen, given the fact that the carnival games that you win these hats cost like two bucks a play. At any given carnival/amusement park, you’ll likely see folks young and old sporting these hats en masse. 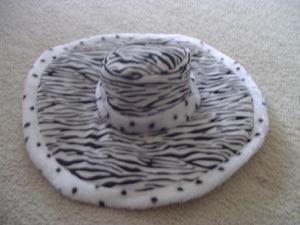 This hat affords me no extra ability, as my pimpin’ skillz are as top notch as they’re gonna get. 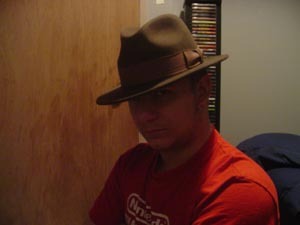 Also known as “the fedora” and “the Indiana Jones hat”, the adventure hat has a very special place in my heart. I bought it during my latest trip to Walt Disney World, and it is the only hat I wear day-to-day. 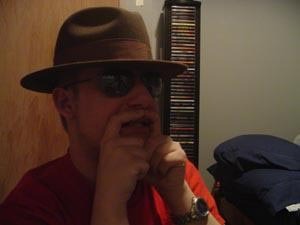 While a fedora is usually reserved for old men, I think it suits me quite well, and it matches with my sweet suede jacket. The adventure hat’s effect is a little more subtle than most. It enhances my adventuring and relic-finding skills to near god-like levels. Like the cowboy hat, it also adds to my innate studliness, though the effect is slightly less than that of the cowboy hat. As a neat little extra, apply aviator glasses and a goatee to the mix and BAM! you’re Adam Savage. The illusion is seamless. Alright, I’ll level with you; the antlers aren’t really mine. We bought them for my dogs to wear, but they turned out to be too big for the dogs’ tiny little noggins. Obviously, it was a big small to get around my enormous cranium. 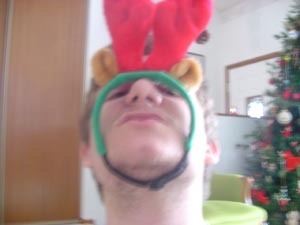 As the antlers aren’t mine, nor are they even intended for human use, they don’t induce any special effects. Okay smartasses, make your greenhorn jokes now and get it over with. 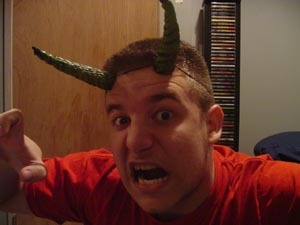 The horns were purchased before one Halloween because I had no costume ideas and I was pretty much picking up anything I could to make a hodgepodge of novelty items. The horns don’t do a whole lot, really. Their main use is making small children afraid and cry. Everything else is simply aesthetic. It was ten bucks okay. You know I’ll buy anything with MegaMan stamped on it. 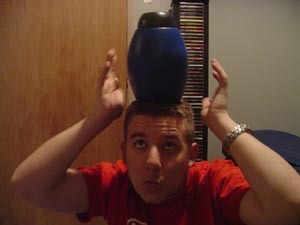 The X-buster, to sum it up quickly, doesn’t do a whole lot when placed on my head. It most certainly doesn’t summon seagulls like I hoped it would. When placed on my hand, however, it allows me to fire small foam darts with almost no accuracy or power. A treasured construction toy of my past, I discovered that I still had my bucket of ZAKS only a scant few years ago. While fooling aroud with them, I also discovered that most of the manual was intact. And what was the coolest thing in the manual? 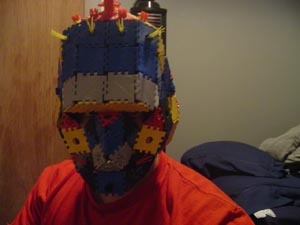 The ZAKS mask of course. It looks kind of like a gorilla head from the right angle. The ZAKS mask, like the horns, does an excellent job scaring small children. Other effects include making people think I’m really smart because I was able to fashion an entire helmet (including a removable neck protector) out of triangles and squares. This hat actually used to/might still belong to my dad, but I do wear it from time to time, when the adventure hat seems like a little too much. I’m pretty sure it’s mine though, because he has another hat and never wears this one. This hat grants me the special ability to look like I play far more sports than I do. It’s useful for getting into the pants of those girls who only like jocks. When paired with sunglasses, it also allows me look a lot older, possibly even enabling me to pass for a slightly shorter version of my dad. These abilities do wonders for camouflauge in populated areas. The foam novelty accessories are a staple of sporting events, and I’m not the kind to not jump on every bandwagon that passes by. 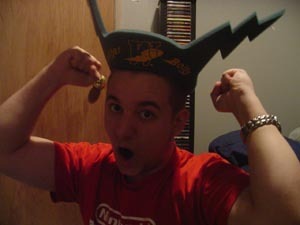 The cliché giant foam hand was my first pick, but since it wans’t available, I had to go with the headpiece. Unfortunately, I’d outgrown it long ago, and now I can’t get it on my head without fear of tearing it in half. The main effect of the bolts is making me holler like an animal while watching the game. Also notable is that they change people’s opinion of you based on how well the Bombers are doing in the current season. So it’s not a hat. Big deal. I’m including it and there’s nothing you can do about it. It’s not a perfect replica of the Conan, but it’s as close as my hair is ever gonna get. It’s pretty similar to “the Steve” as well, it’s just parted differently. 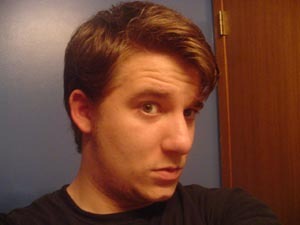 While sporting this “do”, I don’t gain the daywalker traits of Conan O’Brien, but it certainly does attract attention. And that concludes the list of my hats and the various abilities I gain while wearing them. Maybe one day when I’ve collected more hats, I shall show those off as well, but for now this is all.